I don’t know about you guys, but I’m having a rough week over here in England. I do know about you guys. You guys are definitely having a rough week. Times like this, any balm will do. I think he’s in the moment of realizing he can’t go home to his tree, because that’s where the dog is staring. I bet he feels pretty smart for thinking ahead. IMO, it looks like he’s pulling a Jim from The Office at the end. 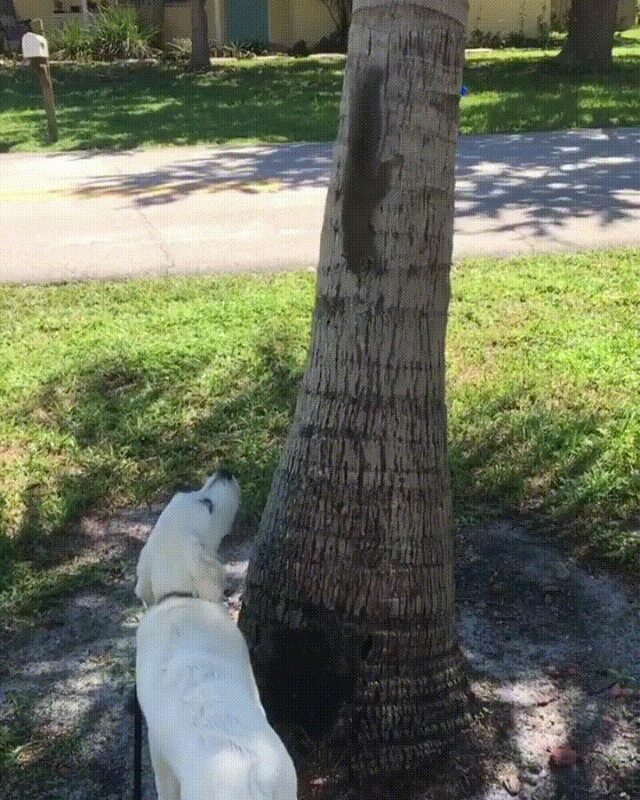 That squirrel is literally waiting for the pup to notice him so he can be chased! So who runs first? You run first? I run first? My old dog loved to chase squirrels at my mom’s house years ago. One day a squirrel would run up a tree, wait for the dog to come back inside, then come back and wait at the bottom of the back deck steps for me to let her out again. This went on for at least a half an hour. They were both having a blast. I thought the squirrel was wondering what the pup was looking at up the tree. The ol’ Bugs Bunny maneuver. Bugs bunny would totally sneak up behind him, make loud chewing-on-his carrot noises until the dog turned around, then ask the dog what he’s doing. Dog will start explaining, then about 10 seconds later, dog will do a comedy double-take, at which point bugs will take off running (with legs spinning in a circle) and the finished carrot would hang in the air for a bit, then drop, and the dog would take off after him. You skipped the part where Bugs is dressed like a pinup girl and I’ve got a belt around my neck listening to “Venus in Furs” wishing I could be a carrot for a day.